You know how I love pasta, right? I have shared with you several pasta recipes, in fact. While most of my pasta recipes use fresh cherry tomatoes as base, I still enjoy a rich juicy pasta sauce from canned tomatoes. It's what I always use in making pork bolognese at home. 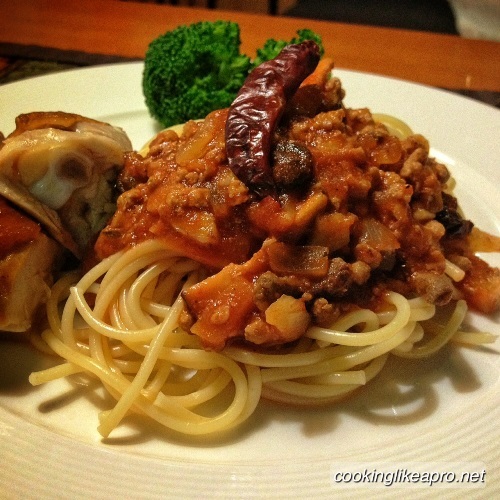 Read on to get my low calorie recipe in cooking pork bolognese. Pork bolognese is an Italian dish that is usually cooked with bacon and pancetta. Since everything with bacon is good; you can imagine how tasty bolognese is! However to avoid the fats, we'll be using lean ground pork (or beef) in this recipe. I promise you that it'll also be good, tasty, yummy and appetizing! We'll add a bit of sweet chili sauce in our mix to make it more delightful. 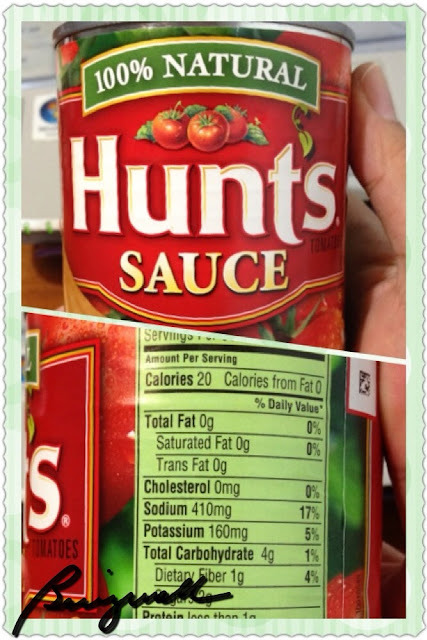 I'm using Hunt's tomato sauce. Aside from liking what I read from its label, this brand also has rich flavors. Steps in cooking pork bolognese. 2. Put oil in a very hot pan. 4. When the garlic turns golden, put in the ground pork. 5. Stir and mix well until the pork is cooked. 6. Set the pork aside in a dry container. 7. Season the pork with a bit of fish sauce and pepper while hot. 8. Put olive oil in the same pan. 9. Saute' the rest of the garlic. 10. When the garlic turns golden, mix in the onions. Stir well. 11. When the onions are soft, mix in the carrots. Stir well. 12. Add in the mushrooms. Stir well. 13. Add in the paprika. Stir well. 14. Add in the pork liver. Stir well. 15. When the liver is cooked, add in the seasoned pork. 16. Lower the heat and let it simmer for about 5 minutes. 17. Add in the tomato sauce and the raisins. 18. Let it simmer for another 5 minutes, still under low heat. 19. Season the sauce with fish sauce, sweet chili sauce and pepper. 20. When the flavor is right according to your preference, add in the seasoned pasta. 21. Garnish with grated cheese come serving time. Cook the pasta as instructed above. Add the pork. Mix well. Season the pork with fish sauce and pepper. Add the pork liver. Mix well. Add the carrots now, if you have them. Add a little water. Let it simmer under low heat. Add the tomato sauce and mushrooms. Let the dish simmer for 5-7 minutes under low heat. Season the dish with fish sauce, pepper, sweet chili sauce and pickle relish. Let the dish simmer for 2 minutes. Adjust the taste, according to your preference. In case there are left-overs, don't worry. This dish tastes better after refrigerating. Here's another pasta recipe - with fresh basil, this time. I love pasta dishes too and have not tried this. Thanks for sharing! This one sure looks yummy! Yum! Yum! This is another awesome pasta recipe, sis. This is another amazing pasta recipe, sis. Thanks for the recipe, sis. Sabi ni misis, kayang-kaya raw nyang i-prepare ito. Thanks for sharing the recipe. i wanna try this at home and feel like a professional italian chef! I prefer bolognese over other pasta variants so I should really like this. Your pork bolognese looks awesome! I bet it tastes even better. Anyway, I've never really eaten this pork bolognese with raisins. So that'll be something new for me to taste. The ingredients look easy enough to procure although I'm not familiar with one of them. Bolognese is Italian Right! I am a pasta fan here. Haaaay. Ma-try nga ito pero mukang bibili nalang ako haha. Di ako marunong sa kusina. My favorite, pasta for the WIN! I will cook this recipe on November 9, my mother's bday. Heehehehehe. Yummy! It looks like something that you can enjoy with rice or pasta. Never had bolognese with raisins though. One more reason for me to try it out. A must try, although I don't eat pork so I might just try the recipe using beef. I hope that won't be a problem. i love joey pepperonis pasta bolognese. I'll try your recipe and look if they taste the same. Thank You! I already saw this post kanina and already made one. Haha! And my husband loved it. Thanks for sharing this sis. Cheers to home cooking. Haha! i will definitely share this to my mother. i am not really into cooking but my mom really loves it. i think she will going to like this one. As a pasta guy, I do get bolognese everytime we eat out. Like you I also love spaghetti in whatever recipe it is, but adding raisins to it is something new to me. I would like to try this recipe though I'm not a fan of pasta in red sauce, my hubby will definitely love it. I loveee pasta, too! I also like fresh tomatoes in pasta dishes, love the natural sour taste of it. Anyway, I notice how you didn't break the pasta when you boiled it. I heard it's really the way to prepare pasta. I told my mother about this but would still break the pasta in two!